I’m curious–do you remember the time or the dish that led you to the beginning of your culinary journey? Or were you fortunate enough to be exposed to the diversity of taste at a young age? We have friends who are well-traveled and as such, their children are far more sophisticated and well-socialized than I ever was at their age. They are not only sophisticated culturally but so are they in their exposure to food. My childhood dining table was rich with Filipino and American fare. When we dined out it was almost always for Asian (Chinese, Japanese, Vietnamese), Mexican or Italian-American food. Nothing wrong with this at all–I just didn’t realize then how much there was for me to discover as my taste buds became more exposed to different flavors. If there ever was such a dish for me, it would be this. I mentioned a few posts ago that I made frequent day trips to the Napa Valley while I was in college. Inevitably, my friend and I would find ourselves at Mustards Grill and I would always order this salad. On the face of it, this is nothing more than fried calamari on a bed of cole slaw…simple. However, at 20 or 21 years of age, I had not been exposed to the idea of fusion cuisine. 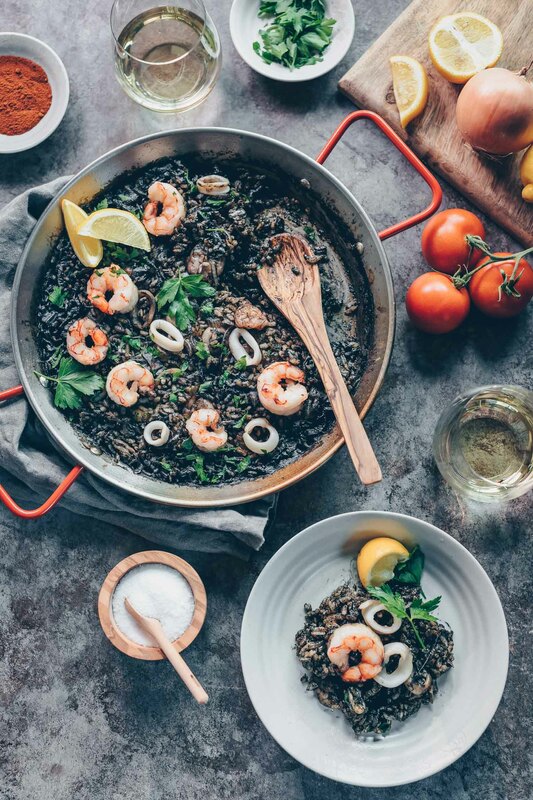 This dish, in its simplicity, delivers well on that idea of combining the best of different ethnic flavors and creating something new. Calamari (which has become the cognomen for all fried squid) is typically regarded as Italian food though variations of it are popular worldwide. Here, it is served with cole slaw, a cabbage salad that is a common American picnic item, but did you know that it has Dutch origins? The term is said to have been adapted from the Dutch name for cabbage salad, koolsla. Kool (cabbage) and sla (salad). But instead of using mayonnaise or plain vinegar as a base, this salad is dressed with a curry vinaigrette, a tasty salute to South Asian flavors. Oh, and the recipe also gives a shout-out to Mexican flavors with the use of jalapeño peppers and cilantro. These components come together so perfectly. My taste buds have been singing in praise of the fresh seafood mixed with the crisp vegetables tossed in the spicy, earthy curry vinaigrette. When I enjoyed this dish over and over again in the early 90s I didn’t realize how much it would feed my burgeoning interest in food. All I understood at the time was how much I enjoyed this salad and when I started this blog, it was on top of the list of dishes I wanted to share here. It was my #1 motivation to try making this curry paste at home. I hope you won’t wait as long to try it yourself like I did. What has been your foodie inspiration? Prepare the secret coating by sifting all the coating ingredients into a bowl large enough to coat the squid. Prepare the vinaigrette: Whisk together the ingredients from the curry paste to the black pepper. When the salt is dissolved, slowly whisk in the olive oil until emulsified. Set aside. Prepare the slaw: Toss the cabbage, carrot, and the one chile together in a large bowl. Cover and refrigerate until needed. To fry the squid: Pour oil about 3 – 4 inches deep into a deep, heavy saucepan. Heat to about 375ºF. While waiting for the oil to heat, prepare the squid by dipping the rings in a bowl of buttermilk, draining it then tossing in the secret coating. Place the squid in a sieve and shake off the excess coating, making sure to separate the pieces that stick together. Working in batches, fry the calamari for about 2 – 3 minutes until just golden. Use a wire skimmer to remove the calamari from the frying pan and transfer on a plate lined with a paper towel. Make sure to allow the oil to come back up to temperature between batches. To serve: Stir the vinaigrette and add just enough to the slaw to coat lightly. 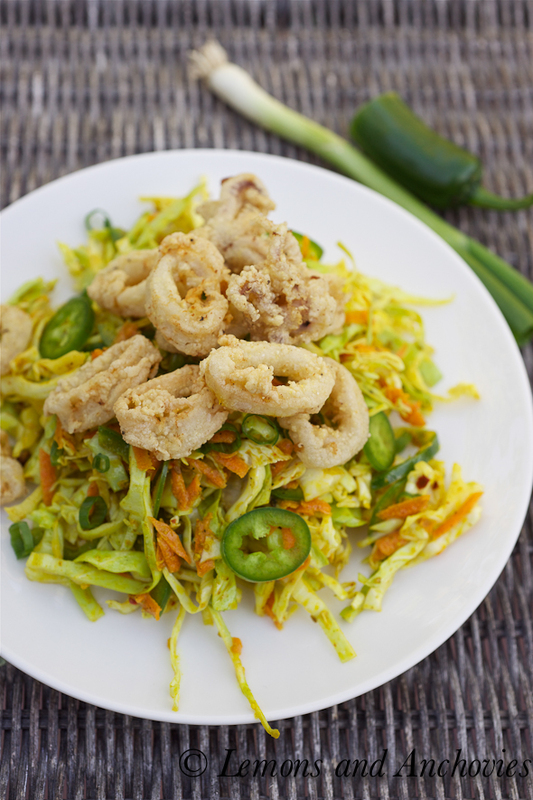 Arrange the slaw on a large platter and place the calamari on top. Garnish with remaining chiles, scallions and cilantro. Serves 6. Yum! This looks very tasty! I love your historical facts and that this was what opened your taste buds to the culinary world. That’s so awesome! I don’t think I have as good a story, lol. This dish looks amazing Jean! I love curry and calamari. My lil man is definitely a foodie in training with all of the foods we expose him to. And I know he’ll grow up enjoying food as much as we do. 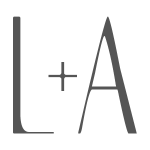 Beautiful salad and loving the new look to your site, too. I wasn’t at all well-traveled as a youth, but my mom (being a schoolteacher with many generous parents and colleagues) always brought home a variety of goods that I now realize I was lucky to get. Banh mi, lumpia, tamales, burritos, kim chee, taquitos, mochi, dim sum. All of these were snacks for me like a bag of chips is to other kids. My school lunch box would have nigiri with umeboshi or furakaki, teri-glazed wings, or Korean fried chicken. The ironic part of this all is that my mom NEVER cooked. But she still gave me an adventurous palate that I’m still using to gobble up as much as I can here in SF (I use the blog as an excuse, but really, it’s my big appetite). And I’m excited to pass this on to my boys — one of their favorite activities is going to the Ferry Building Farmer’s Market! Thanks for sharing Jean! 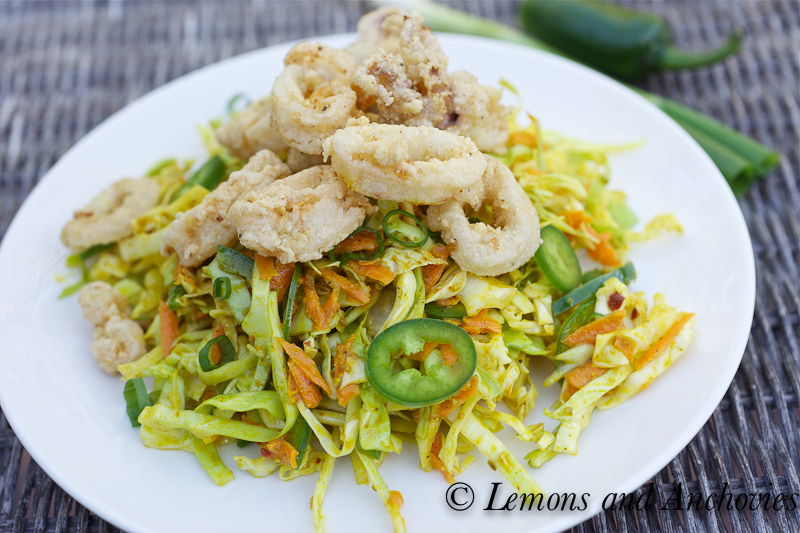 Just my kind of dish… I can’t get enough calamari and I always love it when it’s served with a bright, flavorful slaw. Your palate growing up was much more worldly than you give yourself credit for! 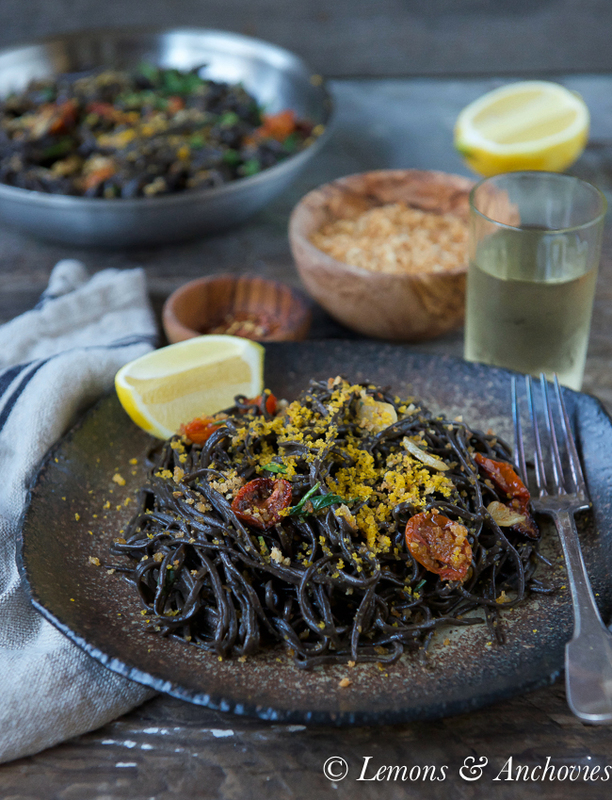 I have encountered so many children that have not explored life beyond pasta and butter, and I just hope that one day their tastebuds will be awakened! This looks like the perfect springtime lunch. I am such a mutt/ fusion concept when it comes to my cooking because of where I grew up, where I trained in school and professional and my mixed heritage it just really a mixed bag of anything goes when it comes to cooking, i think thats what keeps everything so interesting all the time. I love that in this recipe. beautiful job! I am nuts for coleslaw and your version with the curry spices has got me swooning! Can’t think of a better combo with the calamari: next time I am trying this!!!! What a great combination of inspirational memories! This meal is one perfect marriage. 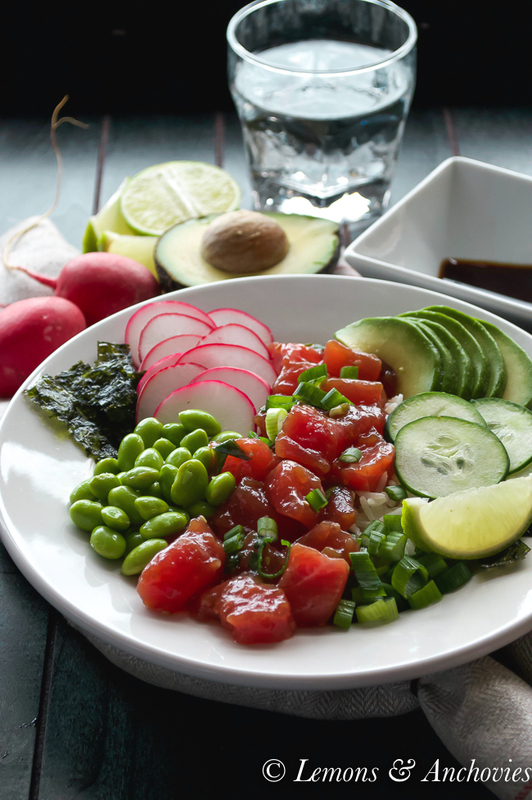 I grew-up with so much Japanese food, including foods I ate while traveling to Japan throughout my childhood, that in some ways I feel my exposure to other cuisines and even American food was quite limited. I must say, post-college is when I really began to expand my “palate horizons”, largely due to quite a bit of foreign travel for work and that inspired me to try different cuisines and restaurants while I was back in the states. The funny thing, is that now that I’m a mom, I hope to expose the kids to a lot of different cuisines but I gravitate towards Japanese food and simple American or Mexican food and of course, spaghetti. 🙂 Your calamari and curry slaw look fabulous. I’d love to dig my teeth into this – – – if only someone else would make it for me! It was mostly Korean growing up for me. It wasn’t until college that my taste buds became introduced to a whole new world of flavors. 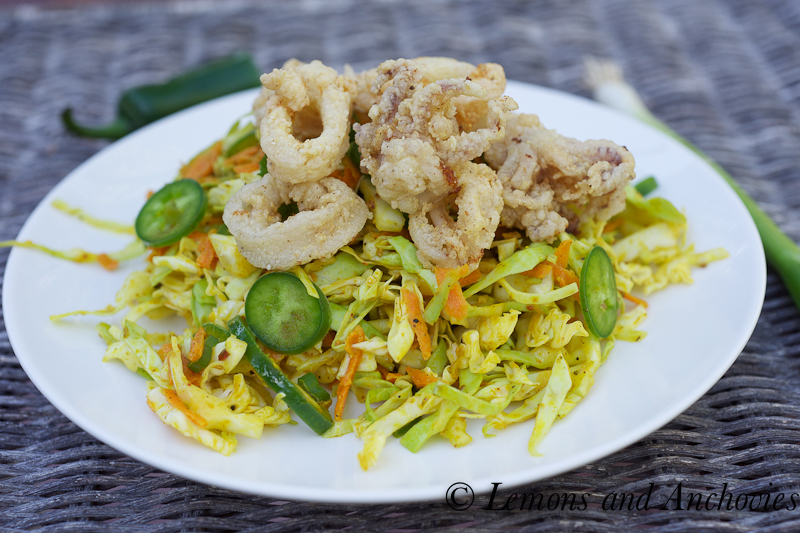 I love calamari and I love this recipe. I add garam masala to my fried calamaris. Vijitha, thanks so much for your comment. 🙂 I’ll have to try your version next time. I always have garam masala in my spice drawer. I bet your version is wonderful! What a great combination of flavors and textures…love it! I really enjoyed reading your post today. And your “international” food looks so fabulous. What a great combination and I MUST try this! I grew up in Japan, so I ate Japanese food everyday, but ever since I came to San Francisco, my daily food choice is amazing! I realized I can’t live elsewhere. I take it for granted – so many kinds of food in supermarkets and restaurants. How lucky we are. Our kids are really lucky in that sense (well, they eat Japanese food that I cook at home tho). Have a great weekend! I was a super super super picky eater! I’m amazed when I see kids eating everything! Travelling plays a I think I started to appreciate food when I moved out of home and when i started to travel. Now, let’s talk about this calamari…back in the day when I did not like fish or similar, calamari were instead a big favorite of mine. I need to try your recipe. Wow!! this is fantastic !! I will surprise my husband with your dish..He will love it!! Oh, yay! I hope he likes it!